Montreal DJ Kaledo Beddo was arrested this weekend after he bit off a man’s ear at Club Chapeau de Fesse. 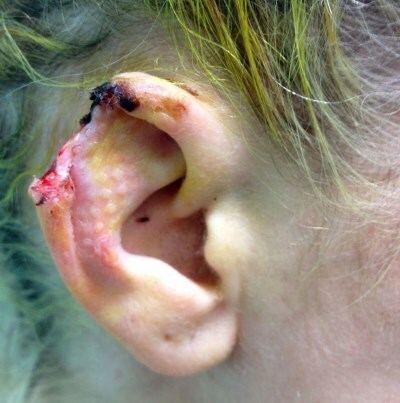 The 24 year old victim was rushed to the hospital, where surgeons failed to reattach his ear. Chapeau de Fesse’s owner John Meindeincul says his heart goes out to the victim, but he should have paid close attention to the warning signs near the DJ booth. “People look at DJs and think that they’re normal human beings,” says John, “but they’re not. DJs are feral creatures, like wolverines or raccoons. They might look cute and cuddly, but they haven’t been domesticated. They're liable to bite people or piss on them, which is why we have signs that clearly warn our customers not to approach the DJ booth. People who ignore those signs do so at their own peril." Every week, someone in Canada is bitten by a DJ, says wildlife expert Henry Calvert. “Ravenews has covered stories like this in the past,” says Henry. “You know as well as we do that DJs are feral. The Canadian government needs to step up and intervene. We need laws that ensure that DJs are treated humanely — and that means returning them to a state of nature, where they can frolic in the forests with their deer friends. Treating DJs like they’re human beings is a type of animal cruelty. Imagine if we treated dogs or bears like they were people? It’s not good for them."